"Entertaining guests and want to show off your talents as a chef? This is the PERFECT dish!! It's light and BURSTING with flavor. It looks like it took hours to make, but you can do it in less than an hour. Everyone will be asking you for the recipe." Place asparagus spears into a large skillet, and pour in enough water to cover the bottom of the skillet about 1/2 inch deep. Place skillet over medium heat, bring to a boil, and reduce heat to medium-low. Simmer until the water has evaporated, about 5 minutes. Stir unsalted butter and pecans into the skillet with asparagus, and let simmer until asparagus are beginning to brown and pecans are fragrant, about 2 more minutes. Remove from heat. Season salmon fillets with salt and black pepper and set aside for about 5 minutes; pat off any excess moisture with paper towels. Heat olive oil in a skillet over medium-high heat, and pan-fry the salmon fillets in the hot oil until browned and the flesh flakes easily and is nearly opaque in the center, 4 to 5 minutes per side. 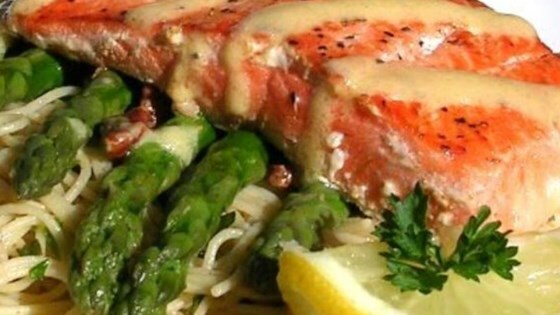 Squeeze half a lemon over the salmon fillets as they cook. Fill a large pot with lightly salted water and bring to a boil; stir in the angel hair pasta, and return to a boil. Cook the pasta uncovered, stirring occasionally, until cooked through but still slightly firm, 4 to 5 minutes. Drain well and return to saucepan. Stir 2 tablespoons butter, parsley, and basil into the cooked pasta until coated; sprinkle with salt and black pepper to taste. To make sauce, melt 2 more tablespoons of butter in a small saucepan over low heat until melted; stir in Dijon mustard, and squeeze remaining lemon half into the sauce. Allow to simmer for about 3 minutes to blend flavors. To serve, divide angel hair pasta between two plates, top each serving of pasta with half the asparagus and pecans, and arrange a fillet over the asparagus. Spoon Dijon dressing over fillets to serve. Love it but next time I would add some garlic to the pasta, parsley & basil, other from that I wouldn't change a thing!! Very good-my husband enjoyed it. To make this lower in fat and calories, I baked the salmon.